With the recent release of Intel’s P35 chipset, and the upcoming release of the performance and budget grade chipsets supporting newer DDR3 technology, DDR2 is about to begin a measured drawdown in performance machines. Granted, we won’t be equating DDR2 to the Dodo for a substantial amount of time, but as soon as DDR3 becomes more plentiful and cheaper, it’ll be time to upgrade if not simply for the significant frequency capabilities of DDR3. For those of you out there looking at DDR3 and sneering at the prospect of upgrading anytime soon, today we’ll be taking a look at some impressive DDR2 modules from OCZ, the PC2-8500 Reaper HPC Edition 2GB kit. 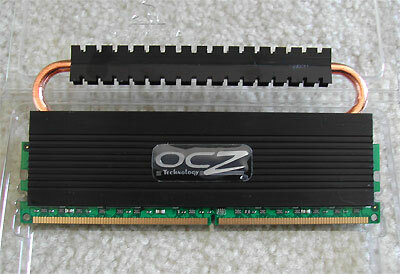 With this line of performance DDR2, OCZ has implemented a heatpipe cooling system for the DDR2 chips. In theory, such a cooling system should allow for increased cooling efficiency given the effectiveness of heatpipes, if everything is implemented correctly of course. Before we delve more deeply into the implementation and effectiveness of this cooling setup, let’s first take a look at the official information and specifications from OCZ for the PC2-8500 Reaper HPC Edition. ..:: OCZ PC2-8500 Reaper HPC Edition Specifications ::.. The Reaper HPC is an innovative patent-pending cooling solution developed by OCZ to effectively minimize heat produced by high-speed memory. As heat rises into the thermo-conductive copper heat pipe conduit, it is dissipated through the strategically-placed compact aluminum fin array. By guiding performance-robbing heat away from key memory components, the unique Reaper HPC design helps facilitate improved overclocking performance, while improving longevity and stability of the modules. The first modules to be incorporated with the new Reaper heatspreader are rated at 1066MHz and run at CL 5-5-5. Featuring an EPP (Enhanced Performance Profiles) programmed SPD, PC2-8500 Reaper HPC modules will immediately boot at the rated specs on the latest generation of NVIDIA® SLI™ chipsets. Although the OCZ Reaper HPC series was coined for enthusiasts, EPP eliminates the need for manual configuration and makes memory optimizations a household item for the complete range of consumers looking to maximize system performance through overclocking. As part of OCZ’s line-up of premium memory, PC2-8500 modules are backed by a Lifetime Warranty and industry-leading technical support. *The Reaper HPC series uses heat pipe technology to rapidly remove heat from the main body of the memory modules and conduct the thermal load to the extended radiator fin array. The addition of the extended fin array nearly doubles the total surface area available for heat dissipation while the heat pipes warrant near isothermicity throughout the entire design. The result is a doubling in effective heat dissipation at equal delta t or, in real systems, a significantly lower operating temperature of the memory modules. **OCZ EVP (Extended Voltage Protection) is a feature that allows performance enthusiasts to use a VDIMM of 2.35V without invalidating their OCZ Lifetime Warranty. ..:: OCZ PC2-8500 Reaper HPC Edition - A Closer Look ::.. In all the years we’ve had performance RAM, we’ve seen almost anything you could dream up in terms of features to garner the attention of enthusiasts. I still remember the days when a heatspreader was the hot feature to have. 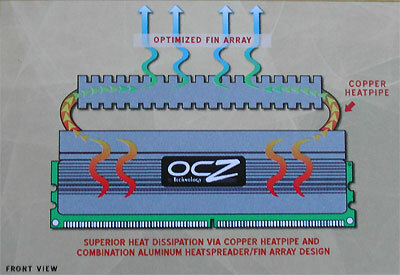 With the Reaper HPC line of DDR2, OCZ has adopted a heatpipe cooling approach to maximize the cooling abilities and therefore, we hope, allow for higher voltages safely and higher overclocking speeds. 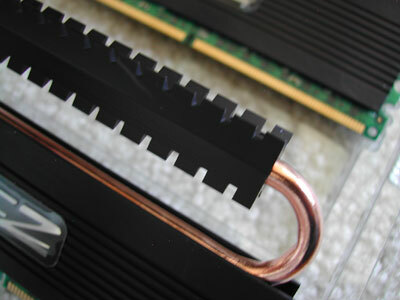 The cooling component for each module consists of two bonded pieces. Each piece of the heatspreader is tightly affixed to the RAM chips and to the other piece of heatspreader. The heatpipe runs along the heatspreader in a fitted groove, and then loops around. There is another set of small bonded heatspreader components on the top of the heatpipe to further facilitate heat exchange. I have to say, I was quite surprised with the overall weight of each module. These are some of the lightest I have worked with due to the lessened material used for the heatspreaders. Even with the addition of a heatpipe and additional heatspreader material along the top, these modules are extremely light. Finally, the overall look of these modules is both sleek and aggressive. The solid black heatspreaders follow along with “Reaper” theme and add a little more flavor to the product as a whole. If you’re sporting a windowed case or have a setup where you can enjoy the guts of your system, these modules would make an excellent addition to any setup.